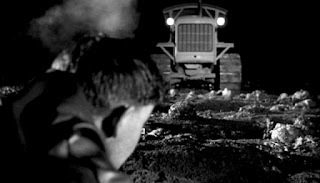 Even by the usual violent standards of Anthony Mann, his 1949 drama Border Incident about the smuggling of Mexicans over the border to California is rather gruesome. It is also a film which impact has not diminished over the years as its very subject matter continues to rouse emotions and hatred. The main character is Pablo Rodriguez, a Mexican policeman played by Ricardo Montalbán, who pretends to be a bracero in order to be smuggled across and this way expose one of these networks. Sig Ruman plays the German headman of the smugglers on the Mexican side and Howard Da Silva plays Owen Parkson, the boss for the whole outfit, with Charles McGraw playing his enforcer. They are all excellent in their parts but Da Silva is the one that stands out. He radiates understated menace. There are a few scenes showing discussions between Mexican and US officials that come across as stiff and speechifying, advocating the importance for cooperation and friendship between the two "great republics", and however important the message might be these scenes almost seem to belong to another film. But the rest of the film is masterful, especially the cinematography, the silences and the constant tension. The framing and compositions are all quintessentially Mann, and the lighting quintessentially Alton. There is probably not a single shot in Border Incident that could not be taken out and exhibited at MoMA or Tate Modern. There is a shot in the beginning of lines of Mexican men with their faces pressed against barbed wire that has such force and desperation it becomes unforgettable. There are also many small scenes that deepens the characters, whether through acts of friendship or acts of violence. And the tension comes from the fact that life has so little value and death comes to almost all characters sooner or later. In one scene, on a truck filled with Mexicans being taken over the border, an old man dies, struggling for breath, and is quickly thrown on the ground and left behind. This is no country for either young or old. Today, even though more people are moving from the United States to Mexico than the other way around, poor workers are still try to get across. The stories told in Border Incident are not just a thing of the past. 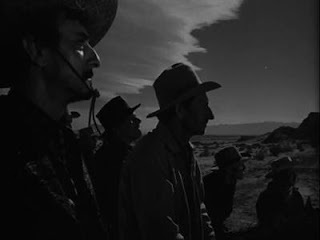 Robin Wood wrote an article in CineAction #46, 1998, primarily about Man of the West (1958), but if you cannot get hold of a copy there is another piece primarily about The Furies (1950) here at Mubi. Mann’s westerns, on the other hand, show little interest in history or in mythology; they are grounded in a fallen world of existential struggle in which the villains often become the heroes’ dark shadows. Typically, when he shoots down his enemy, the Mann hero experiences not triumph but exhaustion, almost prostration, as if he had forfeited a part of himself, his manhood. Imogen Sara Smith wrote about Man of the West as a guest-writer at Shadowlands. In The Furies (1950) and The Man from Laramie (1955), the Lear figures are cattle barons who have usurped huge territories over which their children fight for control. In Man of the West the decaying monument is instead the leader of a gang of bandits. 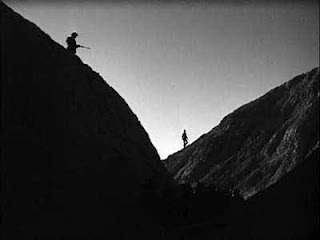 While the plot elements of Mann’s last western owe less to Lear than those of the two earlier films, Man of the West captures best the overwhelming flavor of waste and ruin, of senseless destruction (Kurosawa rightly titled his Lear film Ran, “chaos”), and of irrevocable loss that suffuse the play. Nick Pinkerton wrote about Mann's career for The Village Voice in 2010, to be found here. Before being a moralist or a craftsman, Mann is an artist, that is, he is first and foremost what Proust understood by an artist: a polite man who doesn't leave price tags on the gifts he gives. The voice of Gunnar Skoglund was ubiquitous in Sweden for decades. If you were watching a news reel or a documentary in the 1930s, -40s or -50s it would probably be him who narrated it. He acted in front of the camera too on occasion, directed many films and some theatre productions (including Strindberg and Thornton Wilder), but it is as the poetic voice of a benevolent father-figure he had the biggest impact. 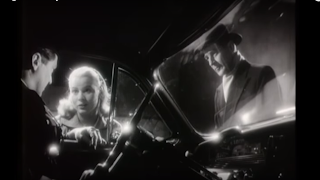 In Nattens ljus (Night Light 1957), written and directed by Lars-Eric Kjellgren, the voice of Skoglund also appears, twice. First before the credit sequence, introducing the main character and her dreams, and then at the very end, telling us that all is well again. It is a suitable, self-conscious choice of Kjellgren, befitting this strange fairy-tale which is mixing adolescent romanticism with cinematic modernism (that word again). It takes place during one night in Stockholm, and the main character is a 16-year-old girl from the countryside who arrives at the central station in the big city because she is to start working with her aunt. But the aunt is not there to meet her, and instead she is swept up in a series of adventures, mishaps and happenings, with all sorts of characters and misfits. At one point she stumbles upon a film set and is given a part on the spot. She also meets a young man and the attraction between the two is instant. It seems everybody she meets is immediately smitten by her, although some are more predatory than kind. There are many creepy males in the film. But there are also three kind policemen who always turn up at the right moment. The young girl is played by Marianne Bengtsson, who had a short and not very striking career. She was twenty at the time of the film and she does look a bit old for the part. Lars Ekborg plays the young man she meets, and although Ekborg is ten years older than Bengtsson he looks almost younger than her and his character definitely behaves as if he was. One of the recurring characters she meets is played by Gunnar Björnstrand, and there are a lot of familiar faces in smaller parts, including Birger Malmsten. But that is not the only Ingmar Bergman connection; it is stronger than that. Kjellgren and Bergman were friends since at least the 1940s (they bonded over their love of Michael Curtiz) and had worked together at Svensk Filmindustri (SF) as script developers before they began their respective careers as writers/directors. On Bergman's first film as director, Crisis, Kjellgren was production manager, and again on Port of Call (1948). In 1950 they wrote, based on a novel by Per Anders Fogelström, While the City Sleeps (Medan staden sover), which Kjellgren directed. (Fogelström also wrote Summer with Monika (1953), which Bergman directed and which has Lars Ekborg as the male lead beside Harriet Andersson.) While the City Sleeps is a more conventional film about juvenile delinquents, but pretty good. On Nattens ljus Bergman received no screen credit but he and Kjellgren developed the script together. The story of Nattens ljus is not particularly interesting, instead it is the style and the atmosphere which are its strengths. It has a peculiar rhythm, intense and dreamlike, with abrupt editing and sudden mood swings. The cinematography, by Åke Dahlqvist, really captures the texture of the neon lights of Stockholm and there are many expertly lit scenes and images. Dahlqvist is primarily known for his work together with Gustaf Molander but the carefully modulated images in Molander's melodramas are here substituted for something more edgy and baroque. 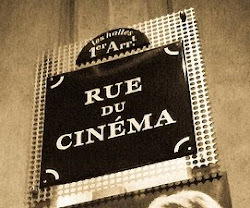 At times it is reminiscent of James Wong Howe's images from Sweet Smell of Success (Alexander Mackendrick 1957). But Nattens ljus is a very different film. There is instead something of Fellini in its cast of characters and general ambience. The film within the film adds to this. (While Nattens ljus is in black and white, the film within the film is in colour.) The music by Lars-Erik Larsson is quite lovely too, and also self-consciously used, shifting between being diegetic and non-diegetic. In 1957 Swedish cinema was about to enter its time of crisis. TV had made its appearance the year before and the renaissance of the 1940s was long gone. But 31 films were released in 1957, including two of Bergman's most famous, The Seventh Seal and Wild Strawberries. Arne Sucksdorff made his Indian docu-drama En djungelsaga or The Flute and the Arrow. Hasse Ekman made two films, the fine satirical comedy Med glorian på sned and one, less successful, drama, Sommarnöje sökes. Among these 32, Nattens ljus was selected to be Sweden's entry to the Venice film festival in 1958. It was in the competition but it did not win any awards. Today it is mostly forgotten, and that Bergman was involved in the making of it is hardly ever mentioned. And neither is Kjellgren, even though he made around 20 films. But now you are reminded of Nattens ljus, and of Kjellgren. Bergman was involved with many different films besides those he directed. Hets aka Torment aka Frenzy, which he wrote and Alf Sjöberg directed in 1944, is the most famous. I will be writing about some of these films during the year, under the headline Bergman connections. If you want to read more about Arne Sucksdorff, here is a link to my article about him. More about Michael Curtiz? I wrote about him here. And modernism I discussed here. If you want to know more of Ekman in the 1950s, then my book will have to do. When I posted this article I included Expedition Röda havet, a spectacular documentary by Bengt Börjeson about a deep-sea diving adventure in the Red Sea, as one of the films released in 1957. Actually it was released in late 1956 so I had removed it but I still want to name it as it is so good.